Pokemon GO Radar Pebble Watchapp PoC - ishotjr.com - Put a little mustard on it! Here’s a dangerously early preview of the Pokemon GO Radar Pebble Watchapp I’ve been working on with @mathew and an all-star cast on the #pokemon channel on pebbledev.slack.com! Found this morning, and was a nice tool to have to instantly check what was around me rather than pulling phone out and checking. Granted it didn’t work half the day, and I have a feeling I know why, but now its not working at all anymore. Hopefully some work around or compromise comes up, as this was an awesome idea, and great setup. 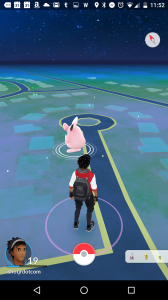 So… Is this going to work considering the latest Pokemon Go update? I have an updated version running on my wrist right now using a new unknown6-aware back end, and it’s working well – still some work to do, including figuring out how to scale, but…things are looking good!